A few of us have recently been inspired by the CMH Gourmand to turn a recreational evening or two into a quest for quality cocktails. The Gourmand’s evening of Mojito Madness, while fun, got very confusing in the face of countless variations, so we decided to choose a well-known standard, the Manhattan: in its most classic form, two parts whiskey, one part vermouth, a dash of bitters, stirred and served up rather than on the rocks. Style matters. Cocktails should be drunk while cold and shouldn’t be too watered down; both considerations argue for a smaller glass. We were charmed immediately by Mouton’s Manhattan, a graceful cocktail in an elegant coupe, and equally happy with DeepWood’s five-ounce conical cocktail glass. Glasses that hold half or two-thirds of a pint are monstrosities (not to mention, if filled with properly made cocktails, irresponsible to serve) and rarely show off their contents well. Substance matters even more. All of the ingredients matter, to an extent that might be surprising. Vermouth can be an afterthought, for example, and most vermouth is pretty bad. The Manhattans that were made at the Rossi, DeepWood, and Mouton with two top-shelf vermouths, Carpano Antica from Italy and Vya from California, really stood out. By contrast, Knead’s Gallo vermouth killed what would otherwise have been an excellent cocktail. Bitters are also crucial: the Barrel 44 Manhattan was so light on both that it received one of our lowest ratings. And while many of the house-made cherries we tried were truly excellent, the dense little cherries produced by Luxardo are downright amazing. Either made ordinary Maraschino cherries seem sad by comparison. For mixologists curiosity is crucial. We were struck by the impact that curiosity had on the end result. DeepWood’s cocktail list shows constant experimentation and innovation, and their Manhattan variants were dazzling. The Rossi, too, recently rolled out an innovative and edgy list, and the focus on quality ingredients comes through loud and clear in the glass. At Knead, the bartender quizzed us on the best Manhattans we’d had — and when we answered candidly, he grabbed a pad of paper and pen and asked us for more details. For consumers, curiosity is crucial too. It may matter even more than choosing the right bar. At most places we visited, the “base” Manhattan was not the best Manhattan that they could produce. (The exception was the Rossi, which made a Corner Creek-Carpano Antica knockout right out of the gate.) Asking about what they could do (and knowing your own taste) was the key to getting the best result. The best example of this phenomenon was DeepWood, whose solid base Manhattan nevertheless gave no hint of the dizzying matrix of possibilities on offer with a little prodding: classic, modern, or Italian (with a touch of Fernet Branca)? Rye, bourbon, or Johnny Walker Black? We especially liked the rye variant at Mouton and the Italian and classic variants, with rye, at DeepWood. These two evenings also highlighted our responsibility as consumers for the end product in the long run. M was on our list largely because of the talent of their mixologist; their Manhattan did not fare as well as others, however, in large part because of the narrow selection of key ingredients behind the bar. Simply put, asking about, and making, good choices supports your restaurant’s or bar’s ability to provide them. DEEPWOOD. 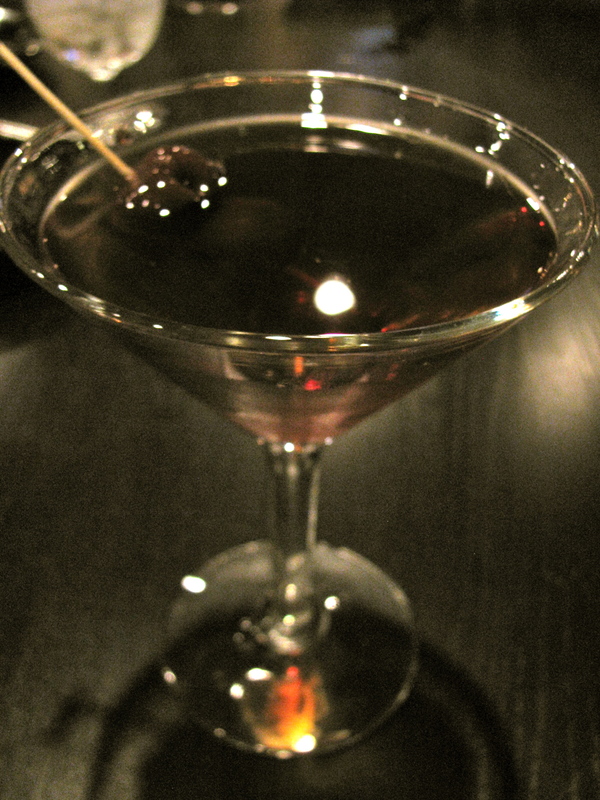 Ordering a straight Manhattan will get you a very solid entrant, made from Bulleit bourbon with Vya vermouth. Asking for a custom-made version opens the door to beverage manager Catherine Morel’s creativity. DeepWood revels in bending the rules, but it’s hard to argue with the results. One variant even included a dash of the (to most) near-undrinkable Fernet Branca, used to excellent effect. THE ROSSI. Corner Creek bourbon, Carpano Antica vermouth, a healthy dose of bitters, and house-made cherries added up to a Manhattan that was hard to fault in any dimension — a delightful ruddy cocktail served icy cold, with just enough viscosity and a bitter-tinged complexity that was simply a pleasure to drink. MOUTON. Classic styling earned some of the highest marks for appearance. One of the Manhattans we ordered, made with rye, was generally deemed excellent — a considerable step above the house-made bourbon version. The latter were less complex and noticeably variable from one glass to the next, some much sweeter than others. KNEAD. Knead uses rye exclusively for their Manhattans as well, which based on other results was a good omen, but the vermouth — Gallo — did not show it off to best effect at all. They were exceptionally curious about our results, however, and by the time we’d left had pumped us for information about the best entrants on our list. We suspect they’ll move up a category or two very soon. M. From previous experience we knew M’s cocktail list to be among the most creative and thoughtful in the city. For the Manhattans they opted for a variant using rye (thumbs up) but only had ri(1), the Jim Beam premium brand, and Martini and Rossi vermouth on hand. This lack of variety, rather surprising behind a bar with enough space for a Sherman tank, was far and away the establishment’s biggest handicap. BARREL 44. Few establishments can match Barrel 44’s stunning advantage in whiskey. Unfortunately, such an impressive endowment can lead to over-reliance on a single asset, and that seems to be the case here: our Manhattans, though made with rye, scarcely tasted of vermouth, and it took multiple sips to catch a hint of bitters. 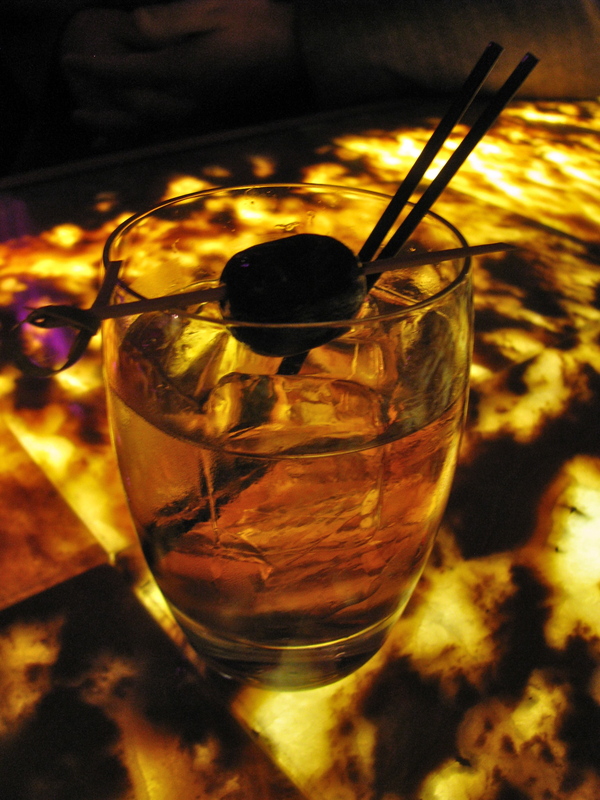 Simply put, this is a whiskey drinker’s Manhattan; even more simply put, this is whiskey. If they learn to love vermouth and bitters, they could become a force to be reckoned with.